using fabric I'd purchased during the crazy sale at Fabric.com from the Vera Wang Lavender fabric collection. Despite vowing I wouldn't or couldn't squeeze another piece of fabric in my sewing room, I caved in 17 yards later. I seriously believe my sewing buddy Andrea and I browsed that site for an hour or more before selecting our fabrics. We chatted about what fabrics we wanted, patterns to pair with the fabrics, chatted some more, selected fabrics, placed them in our respective carts, trying everything to stay within our $36.00 budget, remove some of the fabric from the carts and begin the browsing, selecting, and carting all over again. After completing New Look 6874 paired w/ New Look 6270, I wanted to immediately start another ensemble using New Look 6874 jacket and skirt pieces. I selected the Charcoal poly/cotton houndstooth suiting fabric from the VW Lavender Collection, but realized that I needed simple pattern pieces in order to be able to match the houndstooth print. 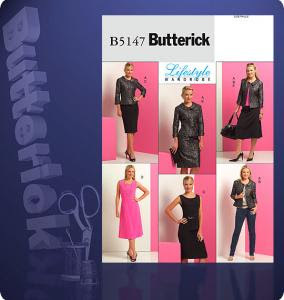 Sifted through my patterns and settled on Butterick 5147, which consist of Misses jacket, top, dress & skirt. The cutting was tricky and vaguely recalled cutting a plaid fabric for a top a year or two ago and in a nano-second vividly remembered it was a total horror. With that awful reminder, I knew I had to pace myself with cutting the fabric. I cut the front part of the dress on the fold and before proceeding with the back piece, unpinned the front from the pattern piece and laid the front atop the fabric and back pattern piece and aligned it against the front piece. I continued on in that fashion and cut the dress, jacket & skirt since I had 5 yards of the fabric. Once everything was done I breathed a big sigh of relief and then tensed up all over again thinking all of this better damn be worth the effort. I figured I'd start with the dress first and pinned it, there was a touch and go moment where my center back seam was off but a lil tweaking and to my surprise the print matched as best it was going to get at the side seams, shoulder seams and most importantly the center back seam - I started doing the cabbage patch...lol I was so excited I attempted to try the dress on with the pins in it, but quickly felt (pun intended) that it wasn't that serious. Instead I did the bust darts, front and back darts to get that out of the way. I really wanted to begin baste stitching the dress, but after a long day at work and 7 days of battling a cold, I couldn't continue on and retired to bed medicated to the hilt and slowing succumbing to sleep as the thoughts of my sheath dress slowly disappeared from my mind. I popped up at 5:00am the next morning with that dress fresh on my mind and immediately began machine baste stitching it. I cut a size 16, but after trying it on noticed that it was too big and removed about 1/4" from each side seam and center back seam and also the dress was too long for my 5'3" frame and removed 5" from the bottom. THis is looking beautiful! Can't wait to see it finished! Wow, what a great idea for that fabric. I have the same fabric, but had not thought of a sheath dress. Yours looks great! It's so good when you get an excellent fit. That dress is looking really nice. Take your time and finish it perfectly. You won't be sorry. Good sewing takes time. I spent last evening ripping apart - completely - the skirt I made to go w/ my boucle suit jacket. I love the skirt, but the wool stretched, and it was touch too big to begin with, so I am going to start from scratch... including re-doing the facings and zipper. I was thinking that seam ripping is my least favorite sewing task by far. I totally know how you feel. But I think it will nag you if you don't rip out the seams and re-do. UGH! Good luck. So far, the dress is very pretty. I will be awaiting the finished dress. It is a wonderful dress, perfect for that fabric. It is a pain ripping out those stitches but you will be so happy you did it. I made a skirt from that fabric and working on a vest. It is great fabric. That's a great dress! I love feminine silhouettes in masculine fabric! Faye said it! What a great idea for that fabric. As for ripping out the stitches, I think you should do it. Think about all the time & energy you put into perfectly matching the plaid - all while tired, sick, and medicated! If ripping the stitches will ensure the finished garment is assembled well, you'll be happy that you did it in the end. Like gwensews said, take your time and do it right. Uh no, now I can't get that damn SOS Band song out of my mind! Thanks everyone for your compliments and suggestions. @ Ann's Fashion Studio: To date the dress is still being worn by my mannequin. I am really trying to get up the heart to rip out the stitches. I thought about it all day and realized that I only need to rip out the side seams of the dress and the lining, but again still trying to get up the heart to do it. @ Lynnelle: LoL at the SOS band song stuck in your head. Thanks for the suggestion. I will definitely look for the See and Sew patterns. I love it! I hope you're able to get the lining in without ripping out all the stitches. Thanks for the plaid tips. Pretty fabric. I know you will work it out! Chocolate...lots of chocolate!